Knee arthroscopy done by orthopedic surgeons “clean up” or repair the cartilage or meniscus in the knee. Typically, knee meniscus injuries will happen one of two times. A large bucket handle tear is one that creates a three cornered flap. This is much like if you catch the sleeve of your coat on a nail. This flap can be stable or unstable. After the initial swelling and pain heals, a stable flap rests in place and does not interfere with your daily activities and use of your knee. An unstable tear will flip up much like the handle of a bucket. If this is occurs, often your knee will lock and you will have very limited movement in your knee. The second type of meniscal damage is wear and tear, or degeneration. This will consist of tiny tears, called microtears, which create a fraying of the cartilage. All of the different types of meniscal damage can be treated by knee arthroscopy surgery. There are two small incisions used for this surgery. In one, the surgeon will place a scope, or a small camera. The other incision is used for a tool which will trim or shave the meniscus depending on the damage that has occurred. This procedure is typically a day surgery and you should be able to walk immediately after it is over. Some people prefer to use crutches or a cane, but if all heals well, you should be able to stop using these after a day or two. Regardless of the injury, researchers are now suggesting that a course of physiotherapy focusing on strengthening and balance, or proprioception, is critical before knee arthroscopy surgery. Studies are indicating such a physiotherapy treatment program can reduce pain and increase function to the same degree as surgery in most cases. This can in some cases eliminate the need for surgery altogether. It also can eliminate the risk of infection and reduce the chances of future osteoarthritis. 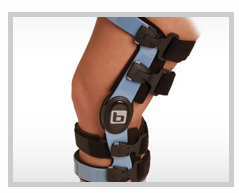 Lastly, sometimes, custom knee bracing can be effective to offload the side of the knee that has a meniscus injury. If you have knee pain, see a physiotherapist today. They can help! Massage Therapy at Erin Mills Physiotherapy Ltd.
Lorne Park Sports & Physiotherapy Ltd.